Many people make a New Year resolution to get fit. This entails joining a gym or health club which is not always a cheap option at the best of times. Fuelled by good intentions and the excesses of Christmas they pay out for memberships that two months later have hardly been used. When you have downsized your life and are watching your income closely you have to decide if a gym is for you or whether there is a better option. In later life it is more important than ever to think of your fitness. If downsizing your life means becoming a couch potato then you must start some form of personal training to keep your heart healthy and your weight down. Gym memberships at expensive health farms may be a false economy or even unobtainable now that your financial status has changed but there is no reason to stop thinking of ways to keep fit. It is now possible to purchase exercise equipment for use in the home. If you have a spare room or an empty garage you could fit in the equipment and perhaps invite friends and family to join in with your fitness regime. But, if you tend to act on a whim and know that you will not use the equipment to its full extent then save your money and look to other ways to keep fit. What can be cheaper than keeping fit by walking? Buy yourself a pedometer and a pair of trainers or comfortable shoes and put one foot in front of the other – simple! Even so we can still talk ourselves out of walking each day. Find a friend or neighbour who will join you in your walks. Perhaps take the dog or even drive to a beauty spot and look at the wildlife and countryside as you walk. It is recommended that we try to walk ten thousand steps every day. This can be a tall order to some people so start by logging what your daily steps are and gradually increasing them. Give up the car and walk to the shops, purchase a shopping trolley so you can’t use the excuse that you have too much shopping and have to take the car! Get off the bus one stop early and try to use the stairs rather than the lift. All these little exercise tips will get you walking your way to fitness. If you find that you enjoy walking join a local rambling club. Most areas have one and they are always welcoming new members. It’s a way to meet new friends and find local places to walk that you never knew about. 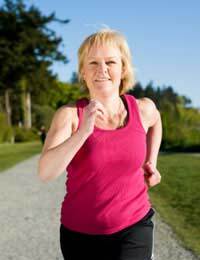 You may find that you enjoy walking so much you want to start jogging or running. All these sports are inexpensive and can be done just by stepping out of your doorway. If you really feel that you need the motivation of a health club or gym then look to your local council as there is bound to be a club attached to your swimming pool or community centre. By attending off peak you can get special rates and use the facilities when it is quiet. You can still have a personal trainer or advisor who will monitor your health and advise you on what route to fitness you should take.